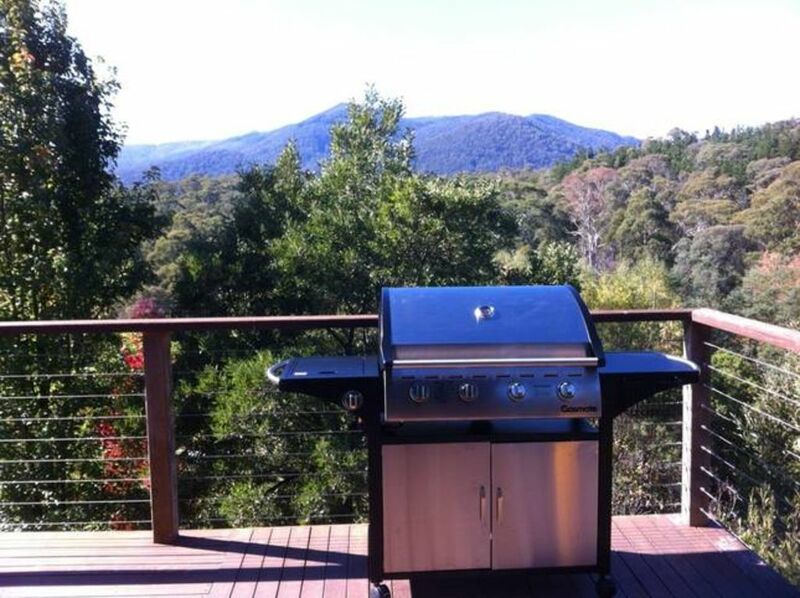 Relax on the balcony with the serene view to Mt Buller and surrounding hills. Relax in the double spa bath. Relax to the sounds of the local wildlife. Relax with friends and family in our spacious 3-bedroom, 2 bathroom chalet. Perfect accommodation for family groups and friends offering fully self contained, well-equipped kitchen and laundry. For your entertainment we have a large flat screen TV, DVD player, Austar (Foxtel) and iPod dock. Our newly renovated main bathroom has a double spa bath, walk in shower, double vanity and separate toilet. For your comfort, the chalet has double glazed windows, heating / air conditioning and ceiling fan. The balcony has outdoor furniture and a 4-burner gas BBQ. The chalet has ski/board storage, outdoor storgae cupboard, bike rack and undercover parking for 4 cars. Conveniently located 3-4 minutes from the entry gates at the base of Mt Buller/Mt Stirling for many activities including hiking, snow sports, mountain biking, downhill biking, sightseeing. Other nearby activities include Golf, Hiking, Mountain Bike Riding, 4-Wheel Driving, Fishing, Horse Riding, Mini-golf, Zoo, Boating, Day Spas and Wineries. Maximise your time away by taking advantage of our late check out time (when available). Established in 1990, Moonlight Ridge Chalet has been providing quality accomodation in Merrijig for over 20 years. *** Discount voucher on all your ski/board clothing and equipment hire from a friendly local business. ***All linen provided and beds are made and ready and waiting for you. NB: Please note that whilst we allow pets at the chalet, the property is not fenced. Management may or may not be around during your stay. If Management are not available during your stay they can be contacted on the details provided when booking . Bedroom 3: 1 queen bed, 6 single beds. Loved the location of Kims house. The views from the balcony are breathtaking. Great proximity to Mt Buller and a lovely restaurant walking distance from the house. The house sleeps 10 comfortably and is ideal for a couple of families of large group of friends. The property was really clean and exactly what was needed for a weekend away. Kim had absolutely all things covered, and the house is perfect for large groups. The views were amazing and it was such a peaceful place. It was a clean, two-storey house. It was a really nice open area, quite suitable for young adults to cook, play games at the big table and hang out all in one space. Lovely birds and brush-tail possum came to visit us. The beds upstairs are too short for adults. We went during the snow season when there was no dryer room, I think they're improving on this. We used the clothes dryer, but it is attached to the en suite wall so you can hear it rattling when you're trying to sleep. Information about the house should be given in .pdf, not .docx because I want to be able to easily save and view on my smartphone. It should be sent a few days or a week earlier. The code for the house should be sent via email and text message on the day before / morning of. We booked a family holiday over the school holidays / snow season & this house was simply fantastic! It was so wonderfully equipped & presented that it made our holiday magical. The kids had a fantastic time being that there were a few board games supplied, a DVD player, it was close to the snow fields etc... which of course kept us as parents happy. There was plenty of room for us all as the rooms were spacious, well presented & in a clean, modern manner. The fireplace made for a cosy evening in, perfect after a day in the snow. I would not hesitate to recommend the house to my family & friends & will be sure to book another holiday next year.